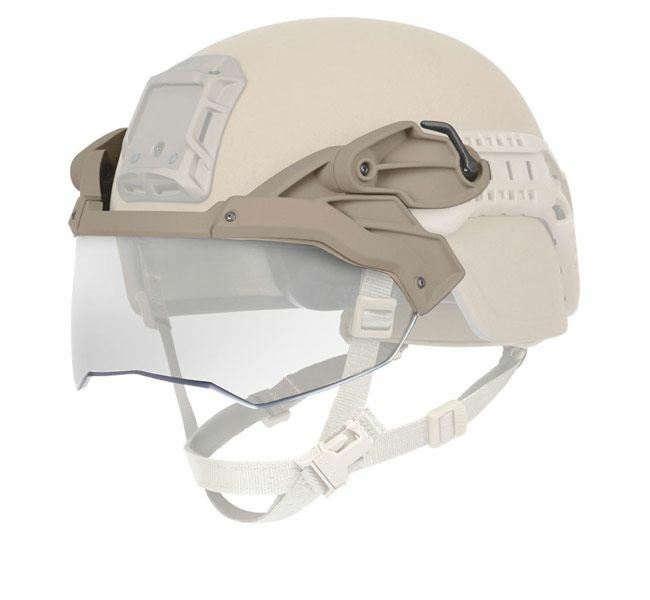 Designed for Ops-Core FAST XP (formerly FAST XP Ballistic High Cut) and LE High Cut Helmets. Seamless integration with Ops-Core FAST XP High-Cut Accessory Rail Connectors (ARCs). Ballistic protection: 17 grain (1.1g) FSP Fragmentation (V50 of 775 fps) Protection in accordance with PRS-1011 Product Specification for Ops-Core FAST High Cut Visor. 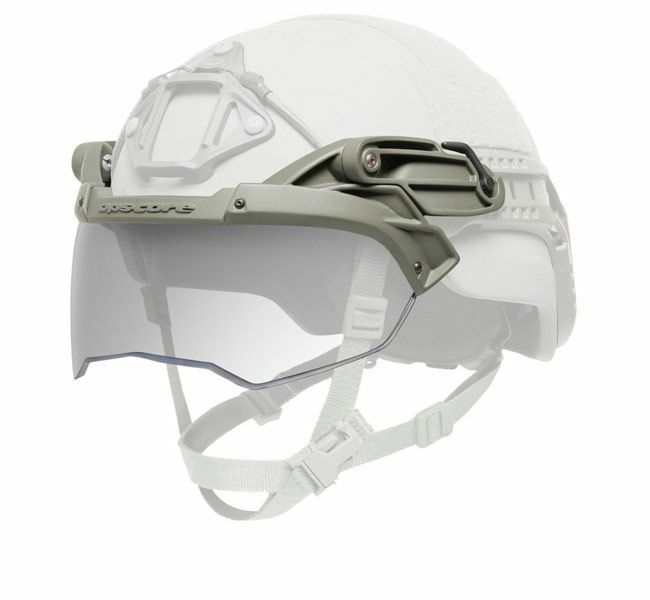 Increases survivability in high threat operations by adding eye protection from fragmentation threats. Visor lens can remain at its indexed position during rigorous activity, requiring no release snaps or locks. Designed for use in conjunction with MCEPs ballistic eyewear and goggles. Designed with anti-fog coating on the interior of the visor and anti-scratch coating on the exterior of the visor. Seamless integration with U.S. Army ACH, USMC MICH Type II, and Gentex Tactical Ballistic Helmet (TBH) Systems equipped with Ops-Core ACH and ACH Skeleton Accessory Rail Connectors (ARCs). Low-profile, unique geometry designed to sit comfortably behind NVGs. Tool-less installation of various lenses depending on mission requirements. Removable rubber gaskets designed to keep dirt and dust out of eyes when in use. Gaskets can be removed for additional ventilation if needed. Retention bungees can be adjusted and locked into place with the cleat system, and allow it to fit with many different helmets. Bungees can be attached to helmet Velcro for quick stowage when not needed. Can be worn during parachute operations and has been tested to work for jump scenarios in 120 mph winds. Meets all the ANSI Z87.1 spectacle requirements for ballistics and optics. Provides MIL-PRF-32432 ballistic protection. 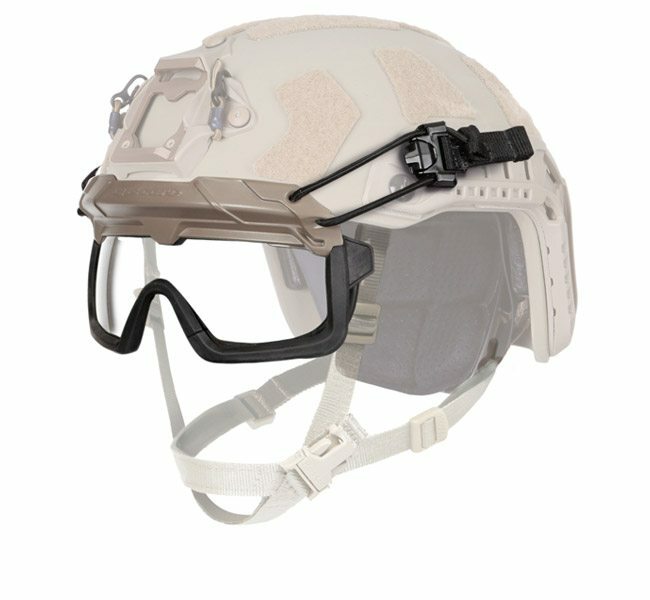 One size fits all system seamlessly integrates with nearly all Ops-Core and Gentex helmet systems with ARCs, regardless of the shell cut. Available Colors: Black, Tan 499, Foliage Green, Urban Gray. Attaches to PVS-15 Night Vision Goggles (NVGs) to help safeguard the eyes and face from fragments and debris with minimal impact to peripheral vision. Easily integrate with all Ops-Core and Gentex helmet systems. 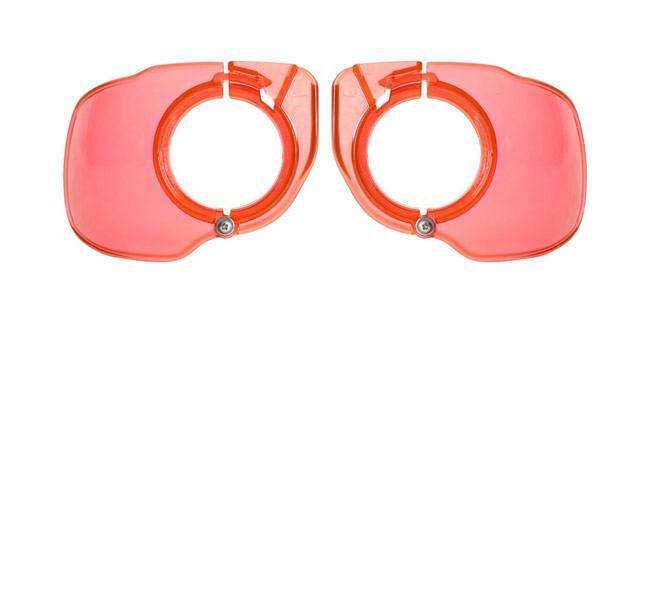 Developed as an alternative to standard NVG rubber eyecups, which compromise situational awareness (as they obstruct peripheral vision) and can lead to fogging of the NVG ocular lens. Available in a Green Glow Occlusion or Clear version. 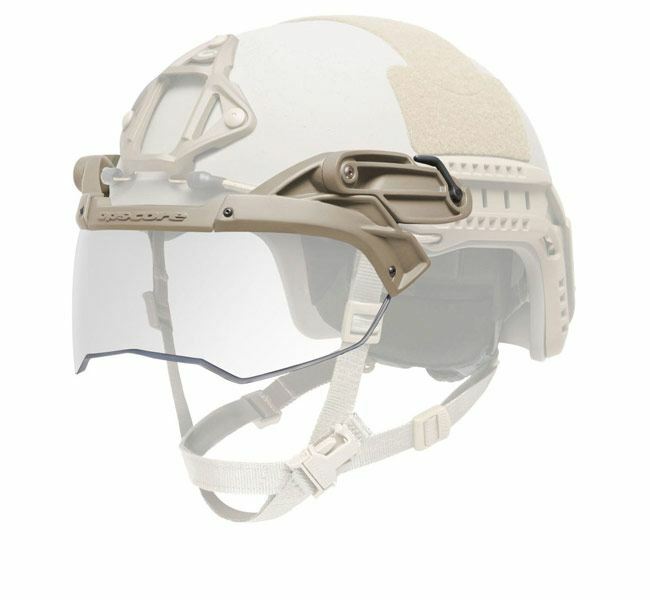 The Green Glow Occlusion version is molded with unique light absorbing dyes that limit the phosphorus green glow that reflects off the face from the NVG tubes, which can also impact situational awareness. Snap on and off without the use of tools. Meet ANSI z87 (modified for this application).